This week’s post is an interview with Bob Genheimer, Curator of Archaeology at the Geier Collections and Research Center at the Cincinnati Museum Center. Bob administers one of the longest running and most successful volunteer archaeology programs in the country. In addition to field excavations, volunteers assemble for several hours every week at the museum to process excavated materials. Back in the mid-1980s one of my first field opportunities was as a volunteer at the Center’s salvage excavations at the Madisonville Site. As an undergraduate student in anthropology, my academic institution showed little interest in having volunteers, but I was welcomed to participate with the regular group at the Museum Center. I have asked Bob to tell us a bit about the Center’s volunteer archaeology program. First off, tell us a bit about yourself and what you do at the Cincinnati Museum Center? My official title at the Cincinnati Museum Center is the George Rieveschl Curator of Archaeology. I oversee both archaeology and ethnology collections at the Museum. 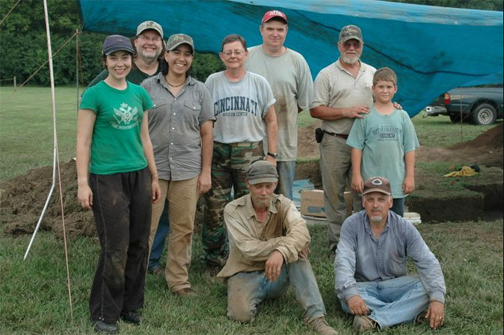 I have been involved in archaeology of the Cincinnati area since 1974, when I participated in my first field school at a Late Archaic base camp near the Ohio River. I have worked as an archaeological intern, survey archaeologist, a CRM consultant, and a collections manager before assuming my curator position in 2003. My interests in prehistoric archaeology include lithics and ceramics, with particular interests in Hopewell and Late Prehistoric assemblages. I also have a deep love for historical archaeology, and in particular, urban archaeology. Most of my research into historical archaeology has been associated with privies, early American ceramics and glass, and the Underground Railroad. The Volunteer Program in archaeology at the Museum Center has been around for a long time. How did the program originate? When I arrived at the Museum more than 20 years ago, the volunteer program was already in full swing. At the time, the Museum had a Volunteer Coordinator, who would advertise opportunities in the Museum’s quarterly magazine. It has never been difficult to get volunteers – the opportunity to work with artifacts in the lab, or help excavate a site in the field, holds a fascination for many people. The Cincinnati Museum Center is probably not much different from many other mid-sized museums in that volunteers must form the core of the work force. Staffing levels and budgets are typically low, and volunteers provide the means of getting things done. And, in archaeology, that means doing all the non-romantic parts of the work. How do your volunteers function today? What exactly do they do? Our archaeology volunteers undertake a myriad of tasks. With ongoing field operations (we do a month-long field school every summer), many of their jobs revolve around fieldwork or lab work. They are instrumental in the field, providing most of the screening and record keeping, but the more experienced ones actually excavate units and features. Other volunteers take care of various logistical tasks. But, the one area that volunteers are most useful is in the lab. Based upon calculations derived from the operation of our field school, a minimum of 18 to 20 lab days are required for every field day. The volunteers do all the washing, sorting, numbering, and bagging of collections once they reach the lab. And, they do it with a real sense of professionalism and pride. Some of my volunteers do other things instrumental to the Department including data entry, photography, reconstruction, and inventory. I would be lost without them. How are volunteers recruited and retained in the program? Today, volunteers are mostly recruited via our Volunteer Services Department. This Department fulfills volunteer requests for all departments in the Museum, and currently directs approximately 800 volunteers throughout Museum programs. I also get volunteers directly through area universities and colleges, many times through connections with archaeology or anthropology departments. I currently have about 20 core volunteers, many of whom have been here more than 5 or 10 years, with a few who have been here nearly 30 years. Throughout the years I have come to recognize two factors that strongly affect volunteer retention. The first is a sense of family. We all know each other, we know our spouses and kids names, and we even know our pet’s names. There is a strong social bond to volunteering, it is not just an opportunity to wash flint flakes, but to catch up on friends and stories. Without this bond, the volunteers have no connection, and are hence reluctant to remain for a protracted time. I will say that most of my volunteers are elderly, and hence share the bonds of age and experience. The trick is to integrate the elderly volunteers with younger, mostly college-age students. It doesn’t always work, but my experience has taught me that the two groups can get along very well. In fact, some of the elderly volunteers enjoy mentoring some of the younger members. The second factor is harder to pin down, but involves a connection between the volunteers and their curator. Volunteers will be more productive, and will stay longer if there is a genuine bond between them and their supervisor. In essence, they have to respect you and believe in what your doing. And, most importantly, you have to instill in them a sense of worth and accomplishment. In my case, I try to constantly teach them what we are doing and remind them of the importance of their work. They have to know that you cannot achieve anything without them. What are some of the significant accomplishments of the volunteer program over the years? Their accomplishments are astounding! Since I began in 1990, archaeology volunteers have processed and catalogued hundreds of thousands of artifacts and artifact fragments from nine major field expeditions. They have entered much of this in an electronic catalogue. They have taken thousands of field and artifact photos. They have reorganized collections. And, they have participated in countless exhibitions. There are rarely “wow” moments in volunteering, but many, many small steps that allow a project to go forward and reach its fruition. How are the volunteer accomplishments acknowledged? It is well known that the Archaeology Department has one of the most successful and longest running volunteer programs at the Museum. On top of my encouragement and recognition, their accomplishments are constantly acknowledged by our Volunteer Services Department. Volunteers at the Museum receive recognition based upon time of service, including years and hours, as well as in broad categories of achievement that reflect their dedication and indispensable nature. Award receptions are held twice a year. Of note, I have two of the longest serving volunteers in the Museum, who consistently place at or near the top in years of service, total hours, and total hours within a fiscal year. Ray Oldenburg talks about the idea of a Third Place – a place that is not work, and not home, but a place where people gather to socialize and be in community – sort of like the coffee house or Cheers stereotype environment. When I think back to my time volunteering at the Center, I think some of the attributes of this Third Place idea might be present with the volunteer group. Do you agree? Yes. The archaeology lab is a gathering place where dissimilar people gather to have fun, tell stories, and play practical jokes. It is a place where politics are avoided, bad jokes are told, and lots of hard work is accomplished. I would like to say it is the archaeology that holds them together, but I know it is this unique social environment that allows them to be a community. And, as I said before, that connection or social bond, is perhaps the most important aspect of a successful volunteer program. That being said, maintaining this community becomes critical. All communities must be infused with new people and new ideas to survive. Maintaining a functional balance becomes important. The biggest lesson has been that volunteers want to know how their little piece of the process (e.g., data entry or scrubbing rocks) fits into the big puzzle. Let’s face it, washing rocks, or putting tiny numbers onto flint flakes, is not exactly what they envisioned when they signed up for archaeology. But, it is all necessary, and its up to the curator or volunteer supervisor to show them the importance of their work. If a volunteer questions why she should write numbers onto animal bones, I show them a faunal list from a similar site so they can appreciate the knowledge that can be derived from properly curating the collections. Another lesson that is quickly learned is that supervising volunteers takes time and dedication. Anyone who believes that volunteers will simply walk in and do the work you are not willing to do has not supervised many volunteers. Volunteers have to be procured, trained, encouraged, and rewarded. It can take up a significant part of your time. As a result, you must apportion your time and volunteer core appropriately. If you have too few volunteers, you will spend an inordinate amount of time training, with few results. If you have too many volunteers, they may accomplish much, but you will have little time to produce and assemble the results (e.g., publications and exhibitions) of their labor. In my experience, I have found it works best to establish a volunteer manager of the lab. This experienced person directs the efforts of the volunteers, and in many instances can answer their questions or explain their task. What are your future plans for archaeology volunteers at the Museum Center? I would like to get them more involved in fieldwork, but with many of them of advanced age, it will require recruiting some younger people. Any words of wisdom for other institutions that are trying to get their volunteer groups off the ground? Be realistic about how many volunteers you can supervise and train. And, clearly identify what you want accomplished. I would set small scale goals and evaluate your volunteer team before undertaking a massive enterprise. And, remember that little of what you intend them to do involves the romantic parts of archaeology. You have to instill a sense of excitement and purpose, and let them share in those “wow” moments when they occur. ← Why a Museum Advocacy Day?